and Outstanding Service for New & Used Equipment! 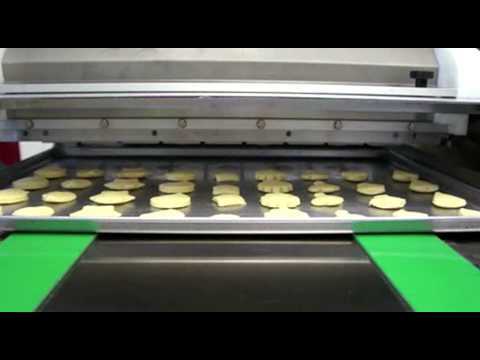 Unisource Food Equipment Inc., is the industry leader in importing, distributing and a manufacturing of Specialty Food Equipment for Supermarkets, Convenience Stores, Wholesale Bakeries, Food Commissary, Restaurants, Hotels, Bakeries, and Food Establishments. Our pledge is to provide our customers with the most efficient, high quality equipment with the best warranty in the business. Our products include a wide variety of Bakery, Floral, Deli, Produce, Meat, Seafood, Restaurant, Front End, Mill Work, Lighting and Total Store Design for any concept. The Unisource Quatro Drop Depositor is so Advanced having the most functions of any machine in the world. It can spritz cookies, wire cut cookies, deposit cake/pastries and mold figure cookies like Ginger Bread Cookies, Christmas Trees by just changing the Hopper. Custom made figure dr ums with logos or other figures also are available The Unisource Quatro Drop has exceptional accuracy with all types of products producing 30 - 35 strokes per minute. 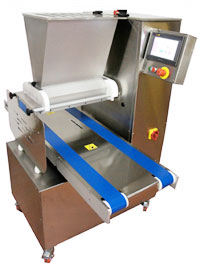 Its advanced color tough screen can store programs in any language for fast depositing of different recipes. COMPACT FOOTPRINT LESS THAN 5' X 7'! The Unisource "Rembrandt" Mini Vapor Steam Tube Deck oven is a static oven which means there are no fans to dry out your baked goods. The most important characteristic of this oven is the Unique Heating System. Heat is supplied by a Dense Network of Patented Closed Vapor Tubes in which the hot steam circulates. The baking chambers on each deck are wrapped by these vapor tubes in the around the entire deck. each vapor steam tube is individually tested and certified at our factory. This unique concept of heating vapor steam tubes provides our customers with low, low energy consumption, quick temperature recovery and the perfect uniform bake every time! This oven is so energy Efficient,after 12 hours of the oven turned off, it still holds 250º! High quality stainless steel is used on the entire outside of the oven for easy cleaning and very attractive look. The doors are made of thick tempered glass, perfectly balanced by stainless steel-lined counter weights for a fast opening and closing counter of each door. The glass is easily removable for cleaning, Also, included are: Halogen Lighting, Fire-Proof Cement Baking Stones, Steam Exhaust Hood with Exhaust Fan, Performant Insulation by Crossed Rock Wool Panels, and Exhaust Accelerator For Gas Combustion. Our Reliable Electro-Mechanical 24 Volt Control Panel is standard in all of our ovens and is very easy to use. Easy Baking Chamber has its own powerful Self-Contained High Capacity Steam System that is ready on demand for Artisan Breads, Bagels and Rolls. We use only the finest Gas Burners in the industry for quick recovery and High Btu Energy Efficiency. The Unisource "Rembrandt" Deck oven is a modular design that goes together fast and easy. 98% parts can be purchased by local Grainger or parts store. MADE IN THE USA. THE SMALLEST VAPOR MINI STEAM TUBE™ FOOT PRINT IN THE INDUSTRY! Unisource Baby Rembrandt™ Gas Fired Deck Oven with refractory baking surface is ideal for hearth baking and you can also bake in regular baking pans. 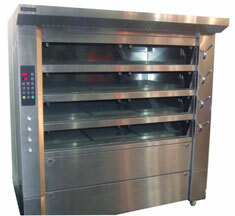 This oven is perfect for all types of product such as breads, rolls, pies, pastries, pizza, etc. The oven comes with its own steam generating system which can work independently in each deck. The oven can be supplied for use with natural gas or propane gas. In either case the consumption of gas is minimal and the baking results are stunning. As standard both models are equipped with a stainless steel stand with wheels for easy placement. There is also a special version for restaurants and cafes on both, stainless steel and copper front. This version comes with a bigger hood as well as a pulling out shelves located between the oven and its base to make it easier for the professional baker to load the oven. • One year parts/labor warranty • 24/7 nationwide service • 98% parts can be purchased by local Grainger or parts store. 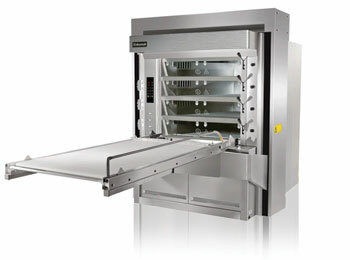 Bakery Aid™: The New Future Bake™ Multi-Fan Rack Ovens are so advanced, It makes your present rack oven obsolete! Our Precision Balanced Airflow System (PBA) produces the most consistant uniform bake in the industry with our Exclusive Three Fan Airflow. Our low velocity fans are located on the top, middle and bottom inside the baking chamber for natural airflow which ensures an Even Bake from top to bottom of rack. Our Energy Saving "Sleep Mode" lowers temperature when oven is not in use. Save thousands of dollars per year! Heavy Duty construction on frame and door with metal tight gasket that needs no replacement. All major Unisource components like transformers, contactors, timers, buzzers, etc., are not built into the PCU board and are easily purchased at your local parts store. E-Z Digital Control Panel with Back-Up Analog Controls and 99 memory recipe presets. Heavy Duty, 2500 lbs Mechanical Rack Lifting System eliminates the need for rack lift motor and costly repair bills. Oversize Stainless Steel heavy duty Heat Exchanger with our unique three fan cooling system prevents overheating, cracking & extends the life of the oven dramatically. Low cost of ownership! All stainless steel interior/exterior & Zero clearance. Easy to install - 2 pieces. Includes stainless steel hood. 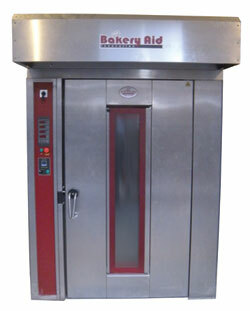 Powerful, Duel Heavy Duty self contained steam system for Artisan Bread and Bagels. Gas burner is located on top of oven to eliminate flour and dust from clogging the burner! Less maintenance and down time!!! Double glass with great visibility and easy to clean. The only 2 Year Parts & 1 Labor Warranty available on the market with 24/7 Nationwide Service! Venting package: Draft Inducer, barometric Damper, Safety Switch. General Product Listing: Below is a comprehensive listing of our products. You can click on a category and go directly to our website product information page for each item listed. Please call if you have further questions or require more detailed information about a particular line or product. We have consultants on our staff to layout, design and provide the best equipment that will work for your operation. We even train your employees at your opening! Unisource's corporate office is located in Holbrook, NY with 25 years of experience in the food equipment industry. The founder, Ronald Mondello is a master baker with a degree in marketing and has the experience to provide the "State-of-the Art" food equipment to the industry. Unisource has the largest selection of food equipment available to our customer with 24/7 nationwide service. Pricing Unisource can offer you the most competitive pricing because of its large volume buying power. Give us a call and you will see why customers are switching to Unisource for better value. We are proud to have a customer reference list throughout the country of our dedication to the food equipment industry. Let us know the area you are located in any we will show you a happy customer.